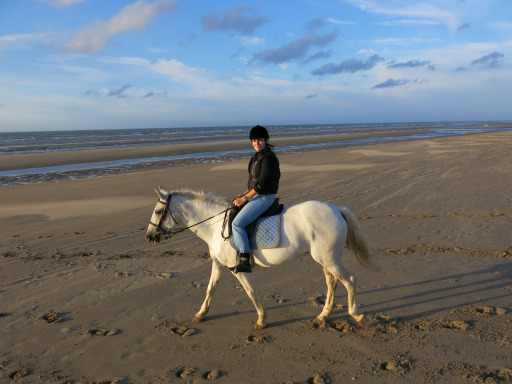 Learn about beach riding on the shore of the North Sea in Belgium. Of course, knowing that I would go to Belgium to see the shrimp fishing on horseback, I asked if there was any way to take part in the fishing itself, but I was told that the most I could do is to ride in the carriage pulled by two horses. This obviously wouldn’t count as a riding in Belgium, so I searched further and found contacts of Equibeach – a nice small manege (another name for stables and horse riding schools) home to about 40 horses of all types of breeds, colors and sizes. Spickey, a rare colored mare of unknown breed, didn’t pay much attention to me during brushing and saddling. But she obviously liked the bit of neck and back massage I gave her. At 6:30 PM three ladies from the stable and I were ready to go. Unfortunately, we couldn’t go earlier because in the high season (from June 15 to October 15) horses are not allowed on the beach between 10 AM and 7 PM. The road to the beach was winding between picturesque dunes, covered with bushes with berries both eatable and poisonous. 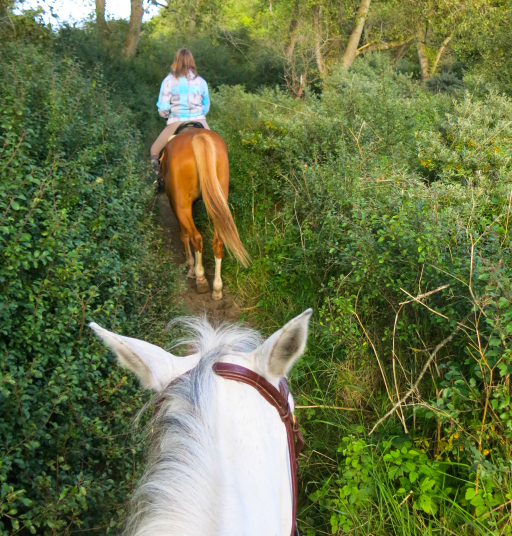 When riding through blackberry thickets, the girls tried to reach the berries on the go. 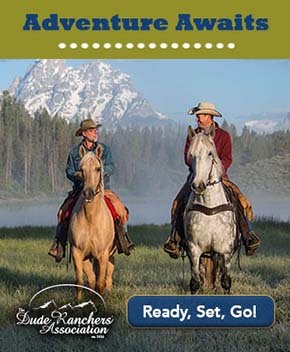 I followed their example and realized that it was an amazing exercise for balancing in the saddle. Long walks were followed by trotting and galloping over the hills and on the narrow paths between the tree trunks. 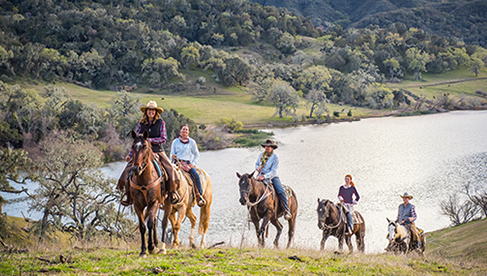 Special traffic signal button for horseback riders. How cool is that?! Dodging away from another branch, I thought that riding on the dunes resembled a computer game. You know, the Mario Brothers kind. Look, you are going through the different levels: riding on grass, in traffic, and on the deep sand of dunes. Eat the right berry and you will obtain life (health), eat the wrong one and… it’s almost certain to disagree with you sooner or later, see the rabbit and you get some extra points, don’t fold fast enough and you will be hit by a low-hanging branch. 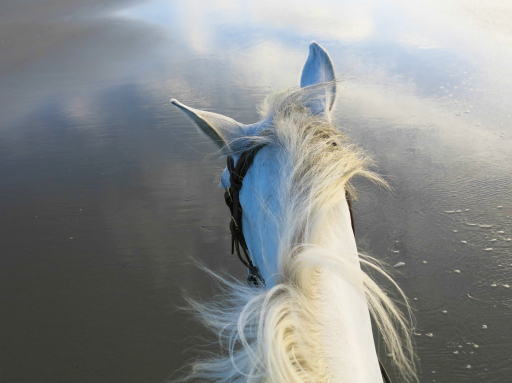 Riding Spickey on the shore of the North Sea. And if you play well enough for an hour or so, you will reach the highest level of the game: the North Sea beach. Some time ago I realized that we rarely feel happy exactly at the moment of happiness. More often we either anticipate it – I’ll be the happiest person in the world when … and if … (fill the blanks) – or understand that we’ve been very happy in the past without realizing it. The feel of current happiness is very rare and thus even more precious. So why am I telling you this? 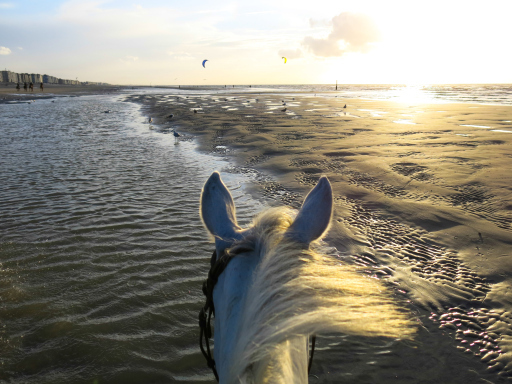 Galloping on the shore of Oostduinkerke gave me that feeling of this exact moment happiness. Maybe because it was the closest I could get to riding on clouds. I think that the whole idea of riding a winged horse came to the ancient horseman’s mind when he was galloping on an ocean shore like this. When the shallow water reflects the sky it’s so easy to mistake land for the heavens and fall in love with the dream of riding on clouds. The world is full of places where you feel a special kind of belonging. Imagine you are somewhere for the first time in your life and yet you feel like it means something very important to you. Is it a place you’ve seen in your dreams? Or is it a place you’ve lived one of your former lives in? Or does it feel that this place will mean something in the future? Koksijde beach was exactly this type of place – inexplicably familiar, inviting, extra-terrestrial, and I know for sure, I will be back here. About the author: Yulia Frolova, self-proclaimed literal “globe trotter” who set herself a goal of riding a horse in every country she visits. Her count so far: 25. Her carrier requires 15-20 international travels a year and might be considered a big obstacle for horse riding, but she sees it as an opportunity to try different riding styles and learn from horsemen all around the globe. Visit her blog where she keeps chronicles of her travels and experiences and follow her on Instagram @equi_geo.